Something special happened when Dolores Huerta and Cesar Chavez met. Together, they fought for the rights of countless farmworkers. Side by side, inspiring hope, they changed history.Algo especial sucediÃ³ cuando Dolores Huerta y CÃ©sar ChÃ¡vez se conocieron. Ellos lucharon juntos por los derechos de los campesinos. Lado a lado cultivaron esperanza, cambiando el curso de la historia. Good to see a book that highlights the work of both Chavez and Huerta. I enjoyed this picture book for two main reasons. First, I like how the content of the book is made appropriate for children. A young reader is able to read this biography and understand the information that is important about Dolores Huerta and Cesar Chavez. The author, Monica Brown, writes the information in a way that is kid-friendly. However, along with the kid-friendly biography, a note for parents and teachers is included in the back of the book. This note has in-depth information about Dolores Huerta and Cesar Chavez for adults. Second, I really liked the illustrations in this picture book. At the beginning of the book, the author is describing the lives of Dolores Huerta and Cesar Chavez before they had met. As a result, the pages have a white border separating them and the backgrounds are different colors. It is not until they meet and start working together that the pages become cohesive and blend into one continuous illustration. As you can see, I have almost read all of Minca Brown's books. If I were a child again, I would have loved all these books. Thankfully I can share them with my students. 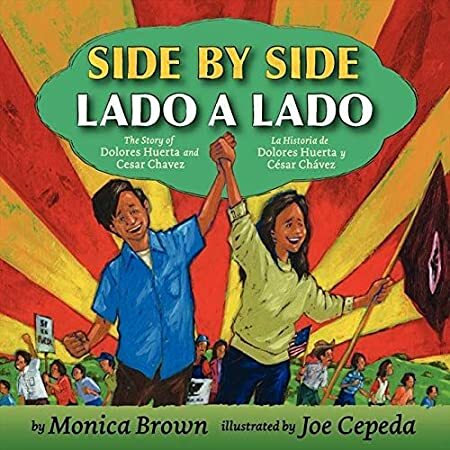 In this bilingual sided by side books tell the story of Dolores Huerta and Cesar Chavez in a compare-contrast kind-of style.